Take the Green Economy Survey! The Mediterranean region is one of the most sensitive and vulnerable social, cultural and environmental hotspots on the planet. Yet current economic practices and policies primarily follow conventional development models that result in depletion of natural resources and externalization of negative impacts. Unlike these traditional economic models, Green Economy (GE) promotes a more inclusive and environmentally friendly development at global and local scale, that recognises the economic value of our natural capital and the associated goods and services, while internalising negative impacts and costs. If correctly applied to the complex and unique Mediterranean context, this approach can lead to a balanced economic development within the ecological limits of the region, while reducing social inequalities and improving quality of life throughout. 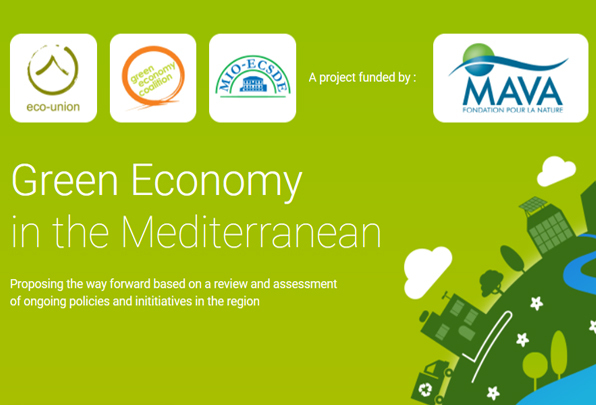 Three international civil society organisations (eco-union, MIO-ECSDE and GEC) have joined forces to shed light on the state of Green Economy in the Mediterranean region through a major study. As a relevant actor on this issue, you are invited to take part in the on-line survey in order to identify initiatives and understand perceptions on Green Economy. The survey should be filled in by 31 May 2016 with an estimated answering time some 10 minutes. The results will be presented mid-July in a public event.